In spite of its delicate and soft petals, there was a strength and energy in the hibiscus that empowered and inspired me. No artist could replicate it, or capture on canvas its living spirit to empower, to influence, to spread joy and teach lessons of life. The greatest lesson it taught me, was the shortness of life, because, after two brief days, it began to droop, wither and fold in on itself in sleep. Immediately, another hibiscus opened up to bloom forth on the same stalk. It was followed by another and another, each waiting while the previous hibiscus died. This reminded me of the expression, “life is a flower that never stops blooming” and the fact that the flowers were rooted in one pot, brought to mind the recommendation on a prayer card: ”Bloom where you’re planted.” (Francis de Sales). 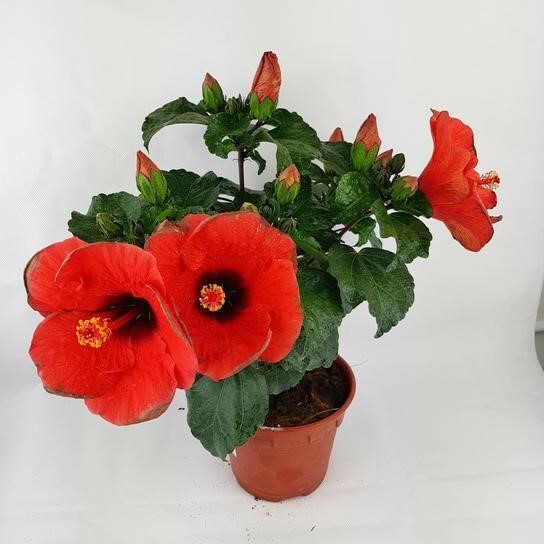 The hibiscus is a tropical flower and also goes by the name of Rosemallow. I believe it is used as traditional medicine in parts of Brazil to regulate fertility in women. It is also used for lowering blood pressure. Like the hibiscus, we have no control over our beginning or end. Suzey Kassem reminds us of this.